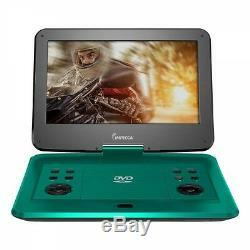 Impecca DVP-1330T 13in Portable Dvd Player, Teal. International Customers: All electronic products are packaged for sale in the US with US voltage. This item is brand-new, factory sealed. 13.3 180-degree Swivel Widescreen LCD. Plays most Audio, Video, and Photo formats. Built-in USB & SD Memory Card Readers, for digital media playback. Built-in 3W Stereo Speakers (1.5W X 2). Copy files from CD to USB. Playback Time: 5+ Hours when used with Headphones. Dual Voltage 100-240V, 50/60Hz for worldwide use. We focus on making purchasing online a pleasant experience. Our sales office is located in beautiful town of Redondo Beach, California, just a few miles South of Los Angeles International Airport. We do not stock any inventory at our sales office. Why are our prices so low? We have modeled our business much like a wholesaler. We sell in huge volume and have streamlined our operations to provide you with the best combination of price and service available anywhere. The item "Impecca DVP-1330T 13in Portable Dvd Player, Teal (dvp1330t)" is in sale since Tuesday, June 13, 2017. This item is in the category "Consumer Electronics\TV, Video & Home Audio\TV & Video\DVD & Blu-ray Players". The seller is "beachaudio" and is located in Brooklyn, New York. This item can be shipped to United States, Canada, United Kingdom, Denmark, Romania, Slovakia, Bulgaria, Czech republic, Finland, Hungary, Latvia, Lithuania, Malta, Estonia, Australia, Greece, Portugal, Cyprus, Slovenia, Japan, China, Sweden, South Korea, Indonesia, South africa, Thailand, Belgium, France, Hong Kong, Ireland, Netherlands, Poland, Spain, Italy, Germany, Austria, Bahamas, Israel, Mexico, New Zealand, Philippines, Singapore, Switzerland, Norway, Saudi arabia, Ukraine, United arab emirates, Qatar, Kuwait, Bahrain, Croatia, Malaysia, Brazil, Chile, Colombia, Costa rica, Dominican republic, Panama, Trinidad and tobago, Guatemala, El salvador, Honduras, Jamaica, Antigua and barbuda, Belize, Dominica, Grenada, Saint lucia, Turks and caicos islands, Barbados, Bermuda, Brunei darussalam, Bolivia, Ecuador, Egypt, Guadeloupe, Iceland, Jordan, Cambodia, Cayman islands, Sri lanka, Macao, Martinique, Nicaragua, Oman, Peru, Pakistan, Paraguay, Viet nam, Uruguay.